This might just be the worst idea I've had since The Gossip Girl Review Project. That's right! I've decided to do Blogmas this year! What does this mean? Simply that there will be a new post on this blog every day between the 1st and the 25th of December this year! Hopefully. Every single post isn't going to be Christmassy themed because 1) that would get boring, wouldn't it? 2) not everyone celebrates Christmas so that would be a terrible month for any of my readers who don't do Christmas, and 3) I don't have enough ideas for Christmassy posts to do that anyway. Also I am not promising that I will manage to upload every single day. Only that I will try to! I have plenty of ideas so that's not what I'm worried about (for once) but we all know December can be a pretty busy month for those of us who celebrate Christmas so I'm sorry in advance if I run out of time and don't manage to get a post up once or twice. Hopefully that won't happen though and I will manage to post every day between now and Christmas! If I do manage it then that will be the most posts I've ever done in one month on this blog, which would be pretty cool. So I'll see you tomorrow for the first day of Blogmas! Gift ideas for Space Girls for under £20. I'm going to be completely honest with you here. This gift guide is only happening because I was doing a little bit of online window shopping and I happened to notice, completely by accident, that a lot of the things I was looking at were space themed. So I went on a bit of a hunt and found a few extra things to make what I hope might be a useful little list of ideas for any of you with space girls to buy for this holiday season! I couldn't make a list of space themed gifts without mentioning Eclectic Eccentricity. I'm pretty sure that's not actually allowed on the internet. 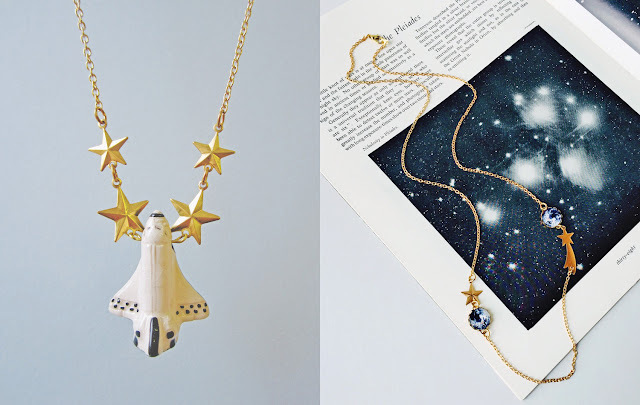 Eclectic Eccentricity are well known for their gorgeous space themed jewellery in particular and for good reason because it is all beautiful! I already have their I'm Walkin' Here! Astronaut Necklace and I love it, so these two beauties are definitely next on my list. If your space girl prefers something a little more brightly coloured, I Am Acrylic has you covered. There are a few space themed pieces in their store but these two are my particular favourites. 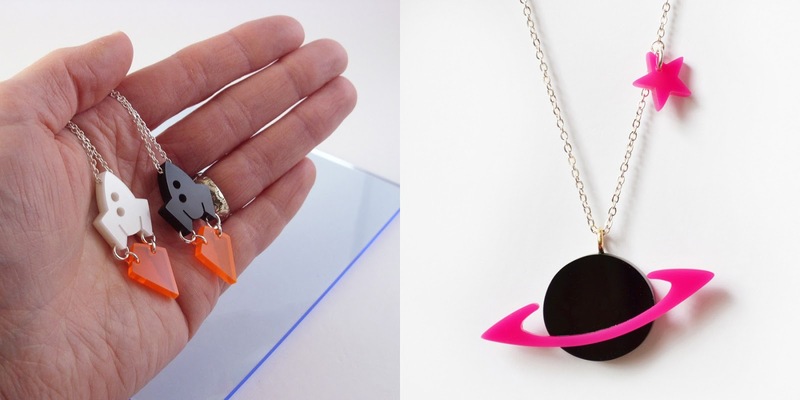 The mini rocket necklace is available in either black or a pearlescent white and the saturn and star necklace comes in three different combinations: black planet with pink ring (shown above), white planet with black ring, or my personal favourite, lightly sparkling blue planet with neon ring. 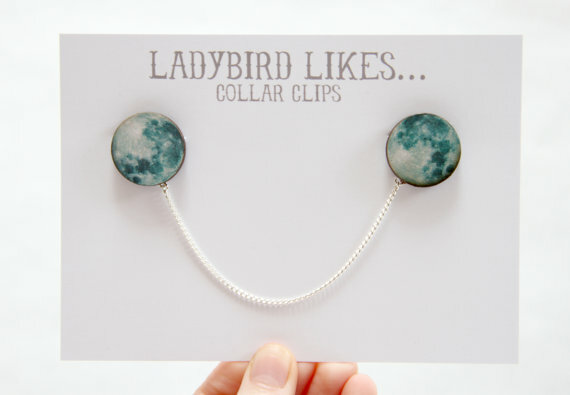 And if your space girl is more into collared shirts than necklaces, Ladybird Likes has these lovely wooden moon collar clips. As well as just being beautiful, these were also worn by Clara in the season eight episode of Doctor Who, Deep Breath. So bonus points if your space girl is a Who fan who might enjoying dressing a little bit like an occupant of the TARDIS. 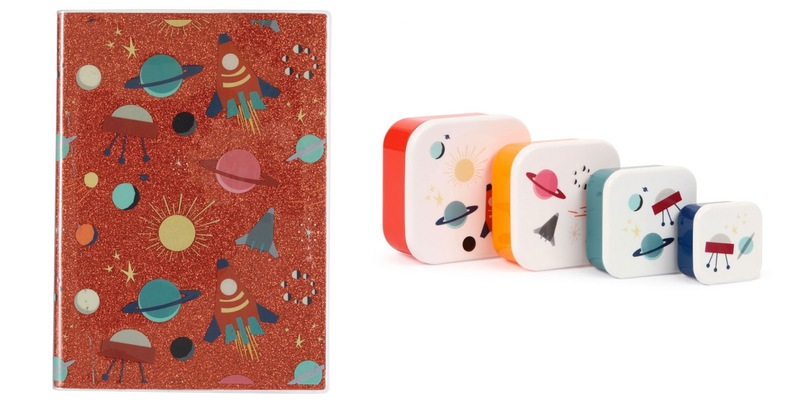 For the more practical space girl, my stationary love, Paperchase, have a super cute retro space design range at the moment. My favourites are this glittery notebook (which I have seen in person and can assure you is every bit as glittery as it looks) and these adorable snack boxes. There are a few other pieces in this range as well, including pens and even a travel card holder, so I definitely recommend taking a look on the website if you don't think your space girl is quite the snack box type. 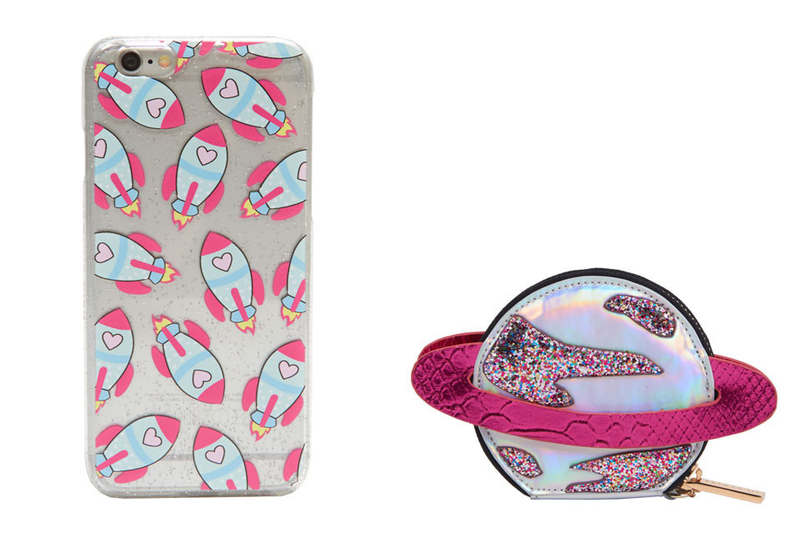 There are quite a few space girl appropriate things on Skinnydip's website but I think this super cute rocket phone case and planet coin purse in particular would be absolutely perfect additions to any space girl's handbag. Just look at all that glitter! Honestly, Skinnydip's selection of iPhone cases makes me super bummed that i don't have an iPhone, but if I did then this heart rocket case would be straight in my shopping basket. And lastly, of course, it wouldn't be Christmas without a pair of socks or two! 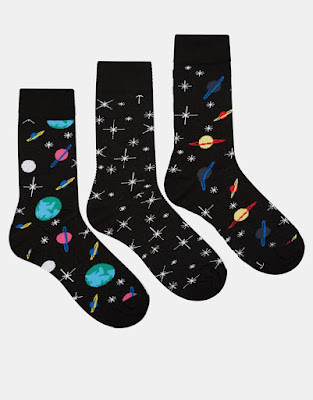 These are actually men's socks according to ASOS but I'm sure we can all agree that socks are socks and these ones would be equally appropriate for any space girl or space boy! What do you think of my choices? Would you consider any of these for the space girls/boys in your life? Let me know in the comments!